In the interest of full disclosure, let me confess that no movie this year has given me more joy than Moonrise Kingdom (Universal). Wes Anderson has made a career exploring the childhood neuroses that keep adult characters in an arrested state of adolescence and stasis. It’s been a lively career with creatively energetic high points like Rushmore and The Royal Tennenbaums but an approach with diminishing returns. Until Fantastic Mr. Fox, a film that refracted his portraits of dysfunctional families and modern anxieties through a storybook world. 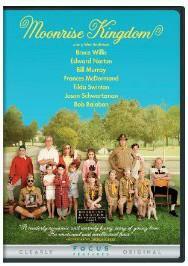 In Moonrise Kingdom, Anderson finally builds a film around the troubled kids themselves. Kara Hayward’s Suzy, a book-loving loner with anger issues, and Jared Gilman’s Sam, an eccentric orphan out of step with his fellow Khaki Scouts, are two misfit adolescents who instantly recognize the other as a kindred soul and run away together into the wilds of a New England island. Which, admittedly, makes escape a little difficult, what with a small army of Khaki scout trackers and a storm on the way.